Ilana Shevach, mother of Rabbi Raziel Shevach, speaks about her son who left behind a wife and six children. Ilana Shevach, mother of Rabbi Raziel Shevach who was murdered in Tuesday’s terrorist attack near Havat Gilad in Samaria, told Channel 20 about her son who left behind a wife and six children. "Raziel is our oldest son. We have four sons - Raziel, Barel, Matanel and Eldan, and a daughter, Ateret. He was married to Yael, an amazing woman, and they have six children. He was a humble child. From what I heard today at the funeral, I did not believe how much of a righteous man he was," the mother said. 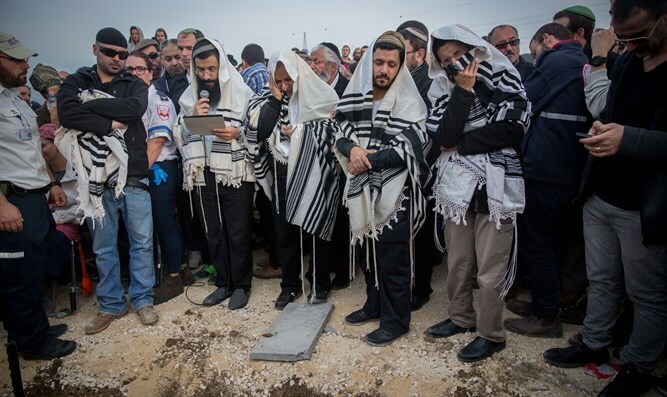 "I was moved by the presence of the Chief Rabbis at the funeral. That was his way, to continue with the Torah and to continue to pray. It was a great honor to see the rabbis who came to pay their respects. If he had seen that he would have been very moved as well,” she added, recalling that she heard about the shooting attack through the media. "I told my husband, ‘That’s Raziel, for sure, it's Raziel.' I called Yael and the girl who was babysitting the children answered and said that a serious incident had happened. Raziel did not answer me. I went to the Meir Hospital, I do not remember how we got there. The doctors were very nice. They told me that he was seriously wounded. I thought for sure he would recover, that he would come out of the operation successfully. Then everyone came and said, 'We tried everything and we share in your grief.'" How are you dealing with this difficult news? "I am strengthened by all the residents of Havat Gilad, by all the amazing people who came to strengthen, my colleagues from work, my friends, all the people of Israel, all of Israel came and strengthened." If you could speak to Raziel again, what would you tell him? Do you remember the last conversation you had? "He visited on Monday, they came to celebrate Yael's birthday, the day before he was killed, he was happy, and as always he came in smiling and happy and laughing. [If I could speak to him again] I would say to him, 'I called you Raziel the angel - and you are truly an angel.'"